The Baby Trend navigator is a fabulous stroller for the parent or caregiver with two kids. I have an 8-month daughter and a 3-year old son and the Vanguard double stroller has been wonderful for me. I am sort of the typical soccer mum with a busy daytime schedule and the stroller really makes my life easy. I can go about my daily business, take out some personal time, and even do my outdoor exercises with my lovely babies right next to me. I got the stroller when my second one came along and have had no regrets ever since. 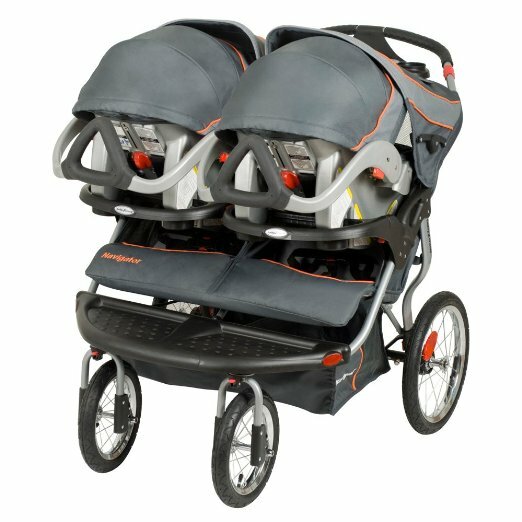 The Baby Trend Navigator Double Jogging Stroller has two rear pneumatic bicycle wheels, which eases maneuverability. The front wheels swivel for easier control and lock for safety. The stroller’s design accommodates two car seats from baby trend. Storage and transport is easier with the trigger folding feature that folds the stroller in two in just one effortless movement. Additional safety features include the reflectors attached to the frame and wheels. The padded rubber handle makes it comfortable to push your baby while on your jog. For a busy mum like me, I totally appreciate the parent tray that has a couple of cup holders. The kids can enjoy their snacks from the two front cup holders and trays. There is a conveniently placed storage compartment for my handbag, the baby bags, or some light shopping. If you enjoy some music while on the move or like playing some soothing tunes for your little ones, then the MP3 speakers and plug-in will come in handy. For the kids’ comfort, the stroller has padded seats that offer individual multi-position reclining. The 5-point harnesses keep your kids safe and secure even while on a bumpy ride. 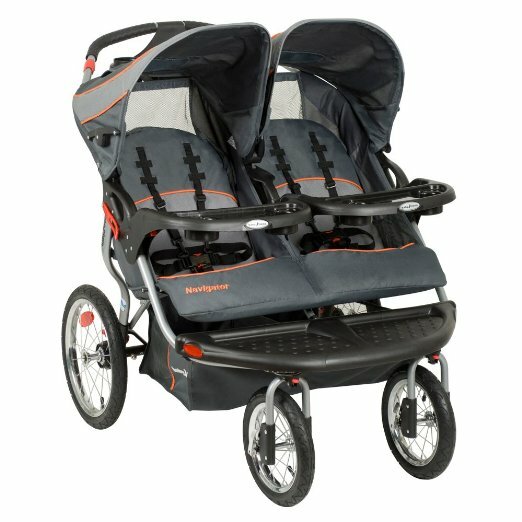 The Baby Trend Navigator Double Jogging Stroller protects your children from the elements by use of the ratcheted canopies. The stroller works best with other baby trend products such as the baby trend infant car seat. It accepts single or double flex lock infant car seats. This highly rated double stroller works well with most other car seats such as Graco and Chicco, or one can purchase a compatible connector separately. Moreover, you can simply use the straps to secure your child on the car seat. 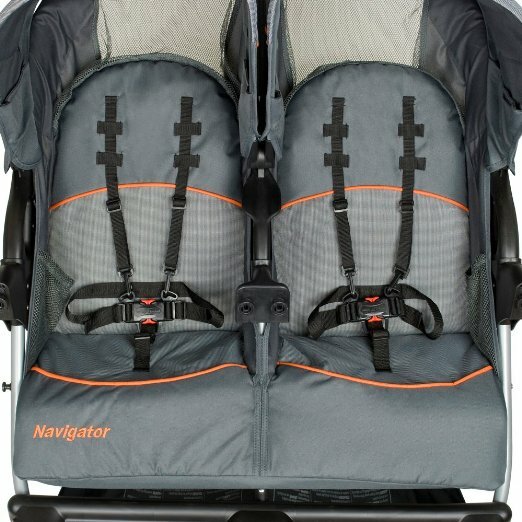 The Baby Trend Vanguard Navigator is great for jogging and for outdoor activity. It is strong, sturdy, and easy to maneuver. It is large enough to provide even older kids enough room for comfort. The safety features give you peace of mind even when jogging at a fast pace, uphill, or over uneven terrain. If you are a hard runner and your kids are heavy, the stroller may experience some uncomfortable shaking and rattling on the move. The front swivel casters may get damaged after some use but the Baby Trend people were quick to do my repairs when it happened to me. While the big size is an advantage in many ways, it is difficult to navigate through small pathways and even standard-size doors. The size of the stroller also makes it difficult to store it in the trunk of your car. Its weight makes it difficult for a small person to carry it without some help. The large size of the wheels makes it easy to navigate over dirt roads, uneven surfaces, and over curbs. The storage spaces are more than adequate and both the adults and the kids have snack space, baggage space, and cup holders. The storage includes an underneath compartment, another on the handle bar, and a pouch behind each of the seats. I got my Baby Trend Navigator Double Jogging Stroller for with latest price and it has provided real value for money. It is not only affordable, but the big size means I can use it till the last child clocks 4 years. Even the larger kids have extra foot space and do not have to curl up to fit or hang their feet dangerously out the sides. From shopping around, I found similar strollers to cost from reasonable price, so the Vanguard is a real bargain. The MP3 plug-in is a nice addition and the speakers are clear enough without being too loud for the babies. The big back wheels are pneumatic bicycle wheels so they are good for almost anywhere. Is It A Pregnancy Symptom?